Developed for two- to four-year-olds, our preschool curriculum focuses on encouraging students to become lovers of learning and independent thinkers by creating an environment in which every day is an adventure filled with learning and growing. This program is intentional, proven, and grounded in scientific research and child development theory. It provides both guidance and opportunities for children to make choices and to take the initiative in their own learning. Our preschoolers have access to their own playground, which is open only to preschool and pre-K students. This ensures safe, peer-to-peer play. Our classrooms are designed to be effective learning environments, divided into “interest areas” with carefully arranged materials and furniture. We help our students learn through play, exploring a wide variety of subjects—especially art, math, science, and technology. Every child has his or her own space for personal things and supplies from home, including a small blanket for nap time and a change of clothes. Baby wipes and diapers / pull-ups must be provided by parents until children are completely potty trained. We sanitize toys and wash sheets each week. Throughout the day, our teachers diligently observe students. We assess their progress and adapt the preschool curriculum as needed. Using a series of tools including documentation, observation, and analysis, we review to evaluate a child’s progress and change as necessary. We also maintain student portfolios to track a child’s growth and accomplishments. Our teachers have access to the resources they need to provide individual, adapted learning techniques. Every child is different, and in Discovery Point’s Preschool Curriculum, we honor that uniqueness. Designed to foster confidence and provide a foundation for learning, our program allows our teachers to deliver positive outcomes for children! 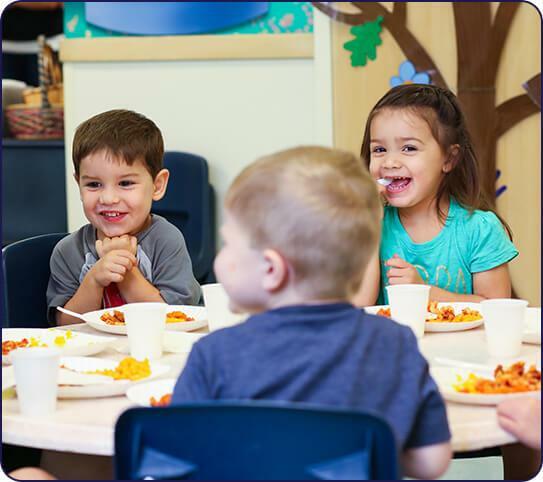 We welcome you to schedule a tour to learn more about our preschool curriculum by finding a center near you to get started today!